The Rogues have their hands full dealing with the Royal Flush Gang and it only gets worse when Johnny Quick and Atomica join the fray! Forever Evil: Rogues Rebellion #5 continues to explore the dynamic between the Rogues and what it means to be a team player for Mirror Master, Trickster, and Weather Wizard. Writer Brian Buccellato has done an excellent job showing the relationship between these “villains” and how they view their role in a world dominated by truly evil forces. Separated from Captain Cold, with Glider in a coma and Heatwave sacrificing himself to save the team, the remaining Rogues have been through a lot during the course of Forever Evil. Each time something bad happens to them (and that is quite frequently), readers learn more about these characters and what separates them from the rest of the villains in the New 52. Buccellato writes these characters very well and clearly understands their dynamic and personalities. The Rogues have done some pretty bad things in their day but Buccellato shows their sympathetic side, getting readers to root for them in the process. Buccellato makes the action in this issue intense and exciting because there is a lot at stake for the Rogues. Throw in a few twists and turns and this is a really fun book to read. One of the many things Buccellato does well in Rogues Rebellion is capturing the personality of all the characters. 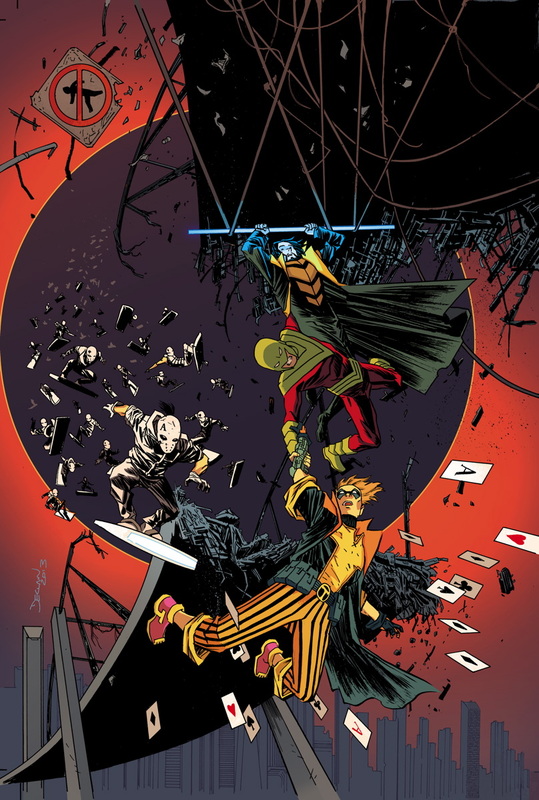 Trickster’s humor adds levity to the book, while Mirror Master’s cautious confidence shows how human and relatable the Rogues are. However, it is Weather Wizard who steals the show in this issue. The character is powerful and has a lot of potential that is not shown very often. At its core, this series is about the team dynamic of the Rogues and Buccellato shows he knows these characters inside and out. He writes these characters well enough to warrant their own series. Rogues Rebellion is arguably the best tie-in book to Forever Evil out of them all. Rogues Rebellion #5 is also the most action-packed issue of the miniseries so far. Throughout this series, the Rogues have stumbled their way through each little crisis and avoided serious trouble. 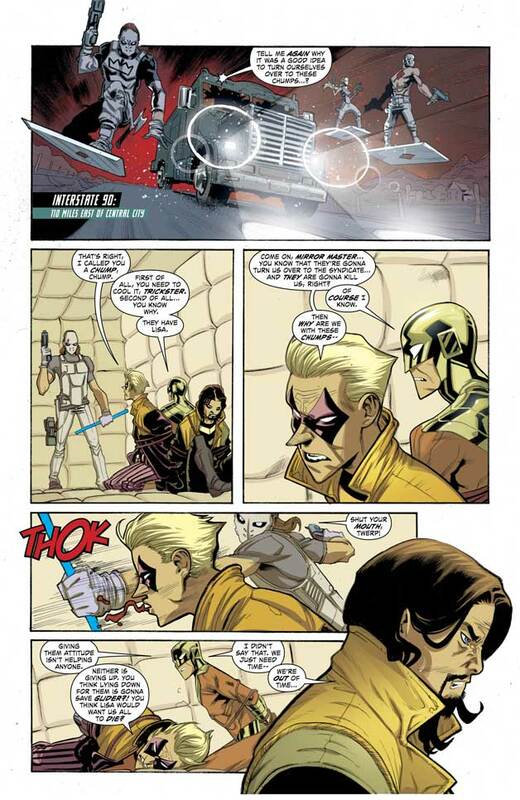 Rogues Rebellion #5 has a real sense of danger, dread, and desperation all thanks to the appearance of Johnny Quick and Atomica. The two villains from the Crime Syndicate are more than the Rogues can handle, even with Central City Police and the Royal Flush Gang distracting the evil duo. Artist Scott Hepburn draws the brutality and violence really well; it is startling when you see what Atomica and Johnny Quick do to these poor souls. One thing Hepburn does well is highlight action, movement, and using his panels for sequential storytelling. Even without the text, the panels on each page still tell a story with energy and excitement. Hepburn’s art is quirky and energetic, which fits the Rogues pretty well. However, the facial expressions are a little bit off at times. It is distracts from some of the emotional beats of the story when a character’s facial expression does not match their emotional state appropriately. Hepburn’s style is a little bit too cartoonish sometimes, and that detracts from the intense action and drama on the page. As mentioned above, he does a great job with the panels to tell a sequential story with energy, but his style can distract from the substance of the page occasionally. Forever Evil: Rogues Rebellion #5 is an exciting, intense, and overall fun issue to read. The Rogues are a lovable band of losers thanks to Brian Buccellato’s excellent character writing. 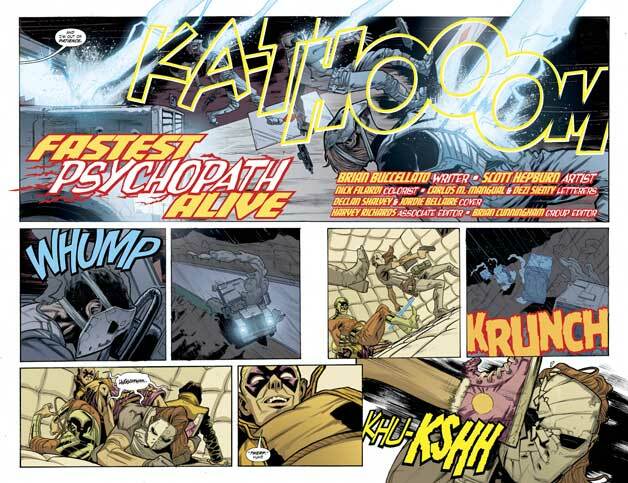 Artist Scott Hepburn highlights all the action and energy on the page while showcasing the brutality of the Crime Syndicate’s Johnny Quick and Atomica. Buccellato and Hepburn have put the Rogues through the ringer in this Forever Evil tie-in and this issue is one of the best of the miniseries, so far.